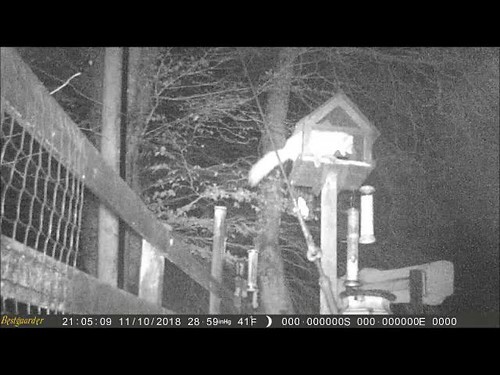 Each day for the last three days a feeder has gone missing, no end of searching has found them - three in all, 2 suet block feeders and a nut feeder. So I set up the trail cam. Got you! It is the Pine Martens. Heaven only know where they are taking them. Our foxes like to carry things off- empty plant pots are always being dragged away into the hedge. It stops the squirrels from being able to pull them down... might keep your pine martins from nicking your feeders! We have recently lost a couple of coconut shells filled with fat to one of the badgers so I can sympathise with you. Always a bit funny, if annoying, to be out foxed by animals. It is quite funny the places 'lost feeders' get to. We are one of the stopping points for railwaymen walking the line,a couple of years ago, one came to see me with two nut feeders and a ceramic bowl. His comment was "tell your buddies not to use the train". One of the feeders was a mile up the track. A mile, that is fair way to carry a feeder. A few years ago we put some eggs out for the pine martens. About 6 month later we moved the rotting base of an old shed to find an egg underneath. I think it must have been forgotten.